This is a compelling tale about the astounding power of fate. The story revolves around two people who are drawn together by random circumstance and perfect timing. Unexplainable connections bring Katie Kosgrove and a total stranger together in the most unpredictable way. Katie’s life begins to change after she purchases some books from a handsome stranger. She discovers a pile of love letters inside her flea market treasures and faces a tough dilemma. Giving in to her curiosity, Katie begins reading the letters and finds she cannot stop. She is immediately captivated by the words on each page. The profound power of the prose consumes her, and Katie finds herself falling for the author of the love letters. She is transformed in ways she never expected. Her only hope is to meet this man again someday. 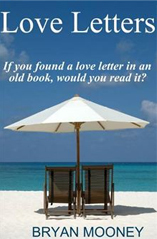 Until then, she will never know if reading the letters was a mistake.